Established in the year 2003, based at Ahmedabad, Gujarat, India, we “Utkal Engineers” are one of the reputedManufacturer of Polyester Webbing Slings, Chain Slings, Cable Carrier, Industrial Slings, Lifting Clamp, Wire Rope Fittings and more. To ensure effectiveness and quality of the products, we test all the products stringently for their performance and quality standards at the vendor's premises using the latest tools and expertise of our quality analysts. Our products satisfy the needs of various Industries like food, chemical, sugar, paper and much more. Spread across an area of 4000 sq ft, we have established a capacious warehouse which helps us in storing our range of Conveying & Material Handling Accessories. With the mass storage capacity of our warehouse, we are able to meet the bulk requirements of our clients in a set time frame. Further, our packaging process is very well coordinated by our team of experienced staff members. With their assistance, we are able to prepare goods for transport on time. 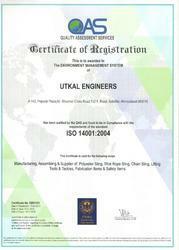 We are ISO 14001-2004 Certified firm. We are ISO 18001-2007 Certified firm. We are assisted and professionally managed by a team of highly qualified and experienced technocrats who are well versed in the domains of marketing, sales, design, engineering, manufacturing, troubleshooting, execution of all types of systems and equipment. Owing to these professionals and their dedicated efforts we have successfully carved a niche in our domain and achieved remarkable organization growth. Our company has attained a reputed status in this domain by offering quality Conveying & Material Handling Accessories. On the basis of well-defined parameters like industry experience, market credibility, production capacity, financial stability and adherence to defined quality standards, our procurement agents select reliable vendors for us to deal with. We procure our range from processors that supply products that comply with IS standards. We are able to garner the bulk requirements of our clients in limited time with the help of our authorized vendor base. Our organization is offering a superior quality and reliable assortment of Conveying & Material Handling Accessories to the clients at industry leading prices. We consistently endeavor to provide quality products and timely services to our esteemed clients. Under our client centric policy, we also allow free sampling of our products so that our valued clients can be completely satisfied before making a deal. Our company is well reputed and known for its uninterrupted supply, timely delivery of products, hassle free payment modes for the convenience of our clients. Owing to the above-mentioned facilities we have been able to garner and cater the demands of our clients spread across the globe.